I was very pleased to see another tale from one of my favourite authors about the Gannon family, with its connections to one of my favourite places on Earth – the Isle of Skye. J.C. Wing’s writing is always so refreshingly true to life, with insights and reflections about a family and the individuals within it; writing that shows brilliant touches of empathy which many other authors try for in their writing but rarely succeed in achieving. This time we have a few new characters, both very young and older, and a situation that is emotional, tense and at times light-hearted and amusing. The events are wrapped around Christmas, a new-born and another little one’s birthday so there are celebrations as well as a police chase to capture the reader’s imagination. Naturally Santa Claus has a small part to play in the tale but so does a sloth called Noodle, best friend to a delightful little girl named Guthrie. The characters and the conversations are real and jump off the page to engage you. Once again I found J.C. Wing’s story to be a page-turner and my only regret was that it took the form of a novella. It should have been much longer to prolong the reader’s pleasure with such skilful prose, dialogue and a narrative that flows so smoothly! This is the latest tale in the Gannon family series but like the others it can stand alone in the way the story is introduced and then continues to its dramatic denouement. If you like contemporary tales about families and their relationships, problems and successes then get to know the Gannons – you will not be disappointed. 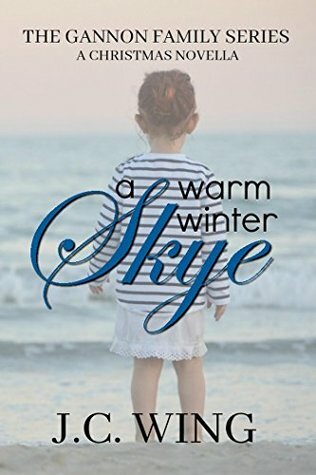 Sign into Goodreads to see if any of your friends have read A Warm Winter Skye - A Gannon Family Christmas Novella.